Nearly a third of traffic accidents occur because one motorist fails to yield right of way to another. The cost is astronomical, in terms of damage to vehicles and injuries to motorists and pedestrians. In the worst case scenario, death can be the result. That is why it is so important to obey the right-of-way laws that are in place for your protection. You must yield when directed to do so by the presence of a “Yield” sign. When you are entering or crossing a highway from a secondary road, you must yield to vehicles already in the highway. If you are approaching an intersection that is unmarked, you must yield to the vehicle that is first at the intersection, and then to vehicles on the right. You must yield to pedestrians in intersections, or in a marked or unmarked crosswalk. You must yield to oncoming traffic when turning left. You must yield to oncoming traffic when turning right on a red light. Sometimes, traffic signals may fail to work. In this case, you must treat the intersection the same way as you would a four-way stop, meaning that the first vehicle to arrive goes first, followed by vehicles on the right. Like motorists, pedestrians must obey traffic signals. In other words, they can walk in the direction of traffic on a green light, but must stop on a red. If “Walk” and “Don’t Walk” signals are in place, these signals apply regardless of the color of the light. 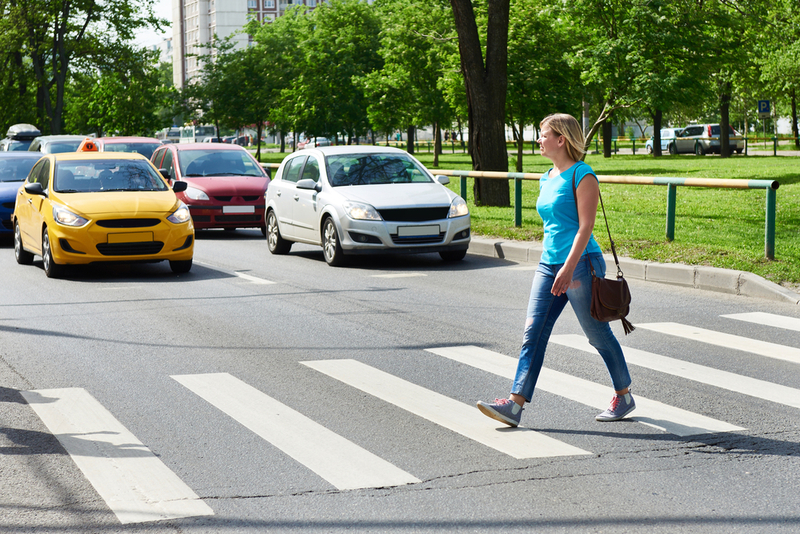 Even if a pedestrian is violating the law (crossing against a light or jaywalking) you must still yield the right of way in the interest of public safety. You must, without exception, yield the right of way to persons who are walking with a guide dog or white cane. They are visually impaired and have the right of way even when ordinary pedestrians would not. Pedestrians and motorists alike must always yield right of way to any public safety vehicle such as a police car, fire truck or ambulance if said vehicle is approaching with lights flashing and sirens sounding. In many states, it is simply considered to be common courtesy to yield the right of way to funeral processions. In Ohio, though, this is not just an optional expression of respect – it is the law. You can identify a funeral procession by lit headlights and purple and white pennants. You must give the same consideration to a funeral procession that you would to emergency vehicles, and in fact, emergency vehicles are the only traffic that funeral processions must yield right of way to. In Ohio, if you fail to yield, you will have two demerit points added to your driver’s license. Fines are not uniform – they are at the discretion of individual jurisdictions. Generally speaking, though, they will range from $100 upward, and court costs may also apply. For further information, refer to the Digest of Ohio Motor Vehicle Laws, pages 69-75.